This is the 101st edition of the Epileptic Gibbon podcast music show and the playlist to accompany it. CLICK HERE TO LISTEN. You can also listen via Mixcloud here. This is a special edition of the show largely focusing on an interview with Matt Baber and Joff Winks of the band Sanguine Hum in which they talk about their latest album, ‘The Weight of The World’, which is pretty much the feature album for this show. 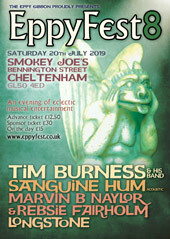 There will also be some tracks chosen by all four members of the band and a further look ahead to EppyFest 2, with Sanguine Hum being one of the acts on the bill. Below you’ll find the track list, plus weblinks to where you can find more information about each artist. Total running time: 2 hours & 9 minutes. Downloaded file is 118 MB. Many thanks to Matt and Joff for coming in to do such a great interview and I’m very much looking forward to seeing Sanguine Hum at their live dates in London and of course at EppyFest. Please leave a comment if you like what you hear (or even if you don’t… feedback is so important!) or if you want to have your say on anything else connected to this podcast. If you want to keep up to date with news about the show, EppyFest, or just chat with other listeners, don’t forget that there’s a Facebook group – just search for the Eppy Gibbon Podcast Show on Facebook and request to join. The next show will be a preview of sorts for my long-awaited best of 2012 shows, so I hope you’ll come back for that. This entry was tagged Canterbury, Electronica, Eppy Gibbon podcast show, EppyFest, Prog rock, Sanguine Hum. Great interview. The start of “In Code” would not be out of place on a Happy The Man recording – high praise indeed. Many thanks Tom. Glad you enjoyed the interview – it was fun to do too. And I really must check out Happy The Man further – I know you’ve mentioned them before.